You know the old expression, “what goes in must come out”. It applies to the tankers too, not literally though. During loading of cargo on oil tankers, when the cargo enters a cargo tank, it replaces the air (Or inert gas) inside the tank. This air (or inert gas) must be allowed to come out of the tank so that the pressure inside the cargo tank is within limits. Same goes during the unloading of the cargo on tankers. As the cargo is removed from the cargo tank, the void created must be replaced by air or inert gas. The arrangements and system provided on tankers for allowing this air to come out of the cargo tank is called venting system. In this post, I will discuss about the primary and secondary means of venting on tankers. This is what the purpose of venting system is all about. So during loading and unloading, how the tanks are maintained at optimum pressure level? Whatever this arrangement is, it becomes the primary means of venting. Let us discuss few of the primary means of venting used on tankers. Mast riser is generally fitted on crude oil tankers as these ships would always carry homogeneous cargo in all tanks. Because crude oil tankers carry homogeneous cargo, the cargo tanks of these ships have a common cargo tank venting pipelines. All these cargo tank venting pipelines lead to the Mast riser. The mast riser is a vertical pipe fitted to the common venting pipelines of all the cargo tanks. The mast riser is fitted with a valve (called mast riser valve). When loading the pressure inside the cargo tank is released through the mast riser by opening the mast riser valve. 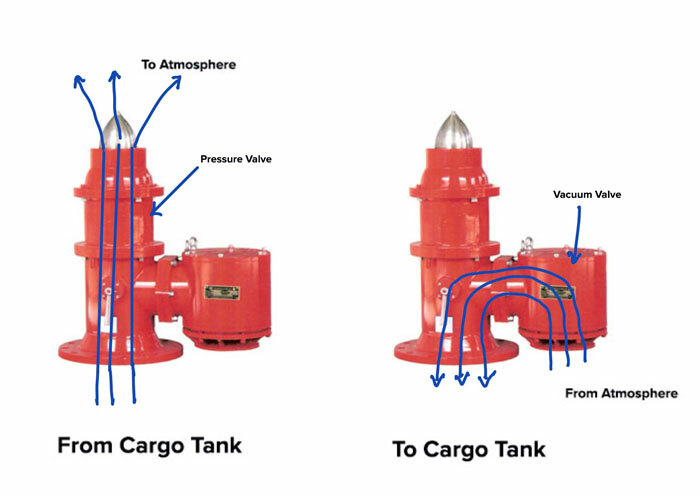 The cargo tank pressure is monitored and if required the mast riser valve is throttled to maintain the cargo tank pressure at certain level. During discharging, we need to not allow the tanks to go to negative pressure. For this, the inert gas is continuously supplied to the cargo tanks. The duty officer sets the desired pressure from the CCR and this pressure will be automatically maintained by auto adjustments of the two valves on the IG system. One of this valve is for release of IG to the atmosphere and other one for supply of IG to the cargo tanks. As per the SOLAS requirement, the height of the mast riser need to be minimum of 6 meters. This is to ensure that the cargo vapors emitting from the cargo tanks through the mast riser does not accumulate on the deck. Mast riser is a good option for venting arrangements for tankers carrying homogeneous cargoes such as crude oil tankers. But for ships that carry different grades, it will not be a good option. 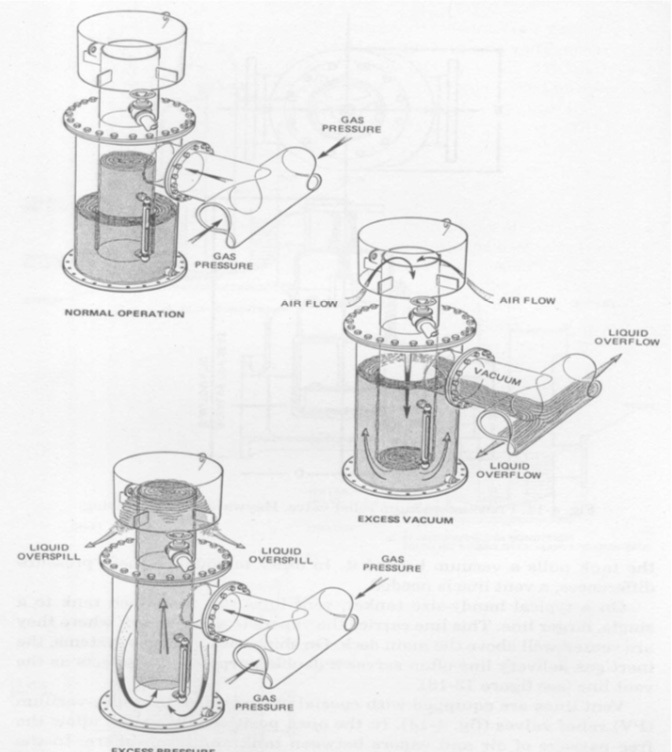 This is simply because the cargoes can get damaged if the vapours of different grades are allowed to mix by having a connection between the vapour spaces of the tanks. PV valves fitted on each tanks solve this issue. PV Valves are also called High velocity vents. Each tank has its own PV valve and the venting take place through the PV valves as the tanks is loaded or discharged. Here is the video that shows the most basic operation of the PV Valves. Even though the video is shown for PV valve fitted on the shore tank, the principle of operation is same for PV valves fitted on ships. Consider this. We start loading in a tank that is closed in all respects. As we are not allowing the air to escape from the tank, the pressure inside the tank would increase as the cargo quantity inside the tank increases. As this pressure reaches 2000 mmWG, the pressure valve of the PV valve will lift and allow the air (or inter gas) inside the tank to escape. As the pressure reduces significantly below the PV valve set pressure of 2000mmWG, the pressure valve of PV valve will again close. Same thing happens while the vessel is discharging her cargo. In this case, with the discharging operation a vacuum is created in the cargo tank. As the vacuum reaches the set negative pressure of PV valve (usually -350mmWG), the vacuum side disk of the PV valve will lift and will allow the air to come inside the cargo tank to reduce the vacuum. This passage of air inside the tanks is only allowed if the tanks is not in inert condition. When we are carrying flammable cargoes and we need to maintain oxygen to less than 8% in the tank, we need to make sure that no air goes in the tank. In this case, we never allow the cargo tank to be in vacuum at any time by continuously introducing inert gas in the cargo tank during discharging. Before I discuss about secondary means of venting, we need to understand why we need these at first place. 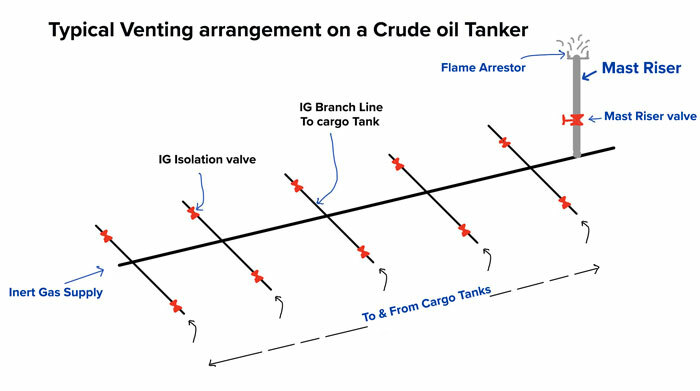 Consider venting arrangement on a crude oil tanker. As we discussed, the primary means of venting on crude oil tankers is Mast riser. This mast riser has a manual valve which is opened only when we need to release the pressure from the cargo tanks. Or when we are loading the cargo in which case it is continuously kept open and throttled according to the rate of loading. But what if we start the loading and forgot to open the mast riser valve. Or if the IG isolation valve to a cargo tank is kept closed by mistake. The pressure in the cargo tank will keep on increasing and cargo tanks will rupture. 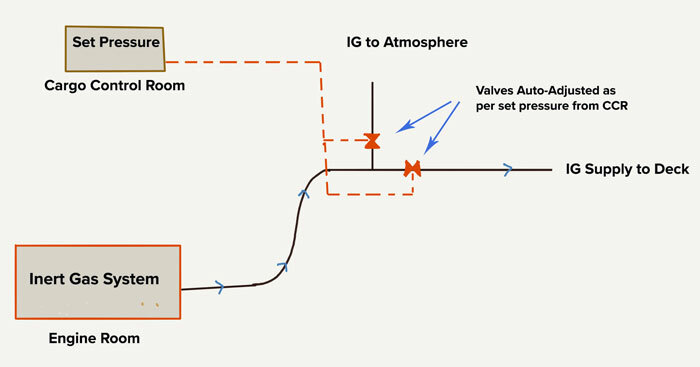 To overcome situations like these, SOLAS requires that there need to be a secondary means of venting which activate if the primary means of venting fails. 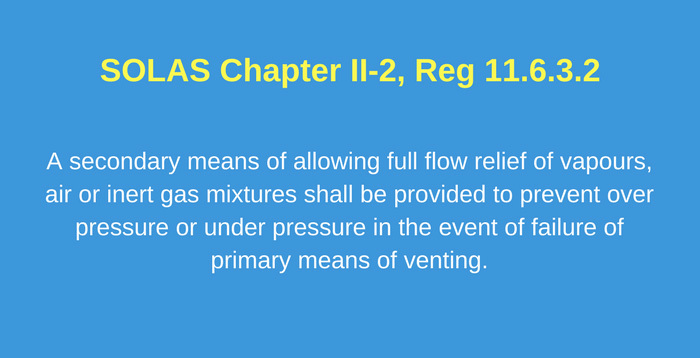 A secondary means of allowing full flow relief of vapours, air or inert gas mixtures shall be provided to prevent over pressure or under pressure in the event of failure of primary means of venting. Now that we know the purpose of secondary means of venting, let us discuss the equipment that can act as secondary means of venting. Yes, PV valve fitted on the individual tank can act as the secondary means of venting. For example, if the mast riser valve is inadvertently left closed while loading, the PV valves of the cargo tanks will get activated. But what if there is no mast riser on ships like on chemical tanker? Can the PV valve fitted on each tank act as the secondary means of venting? No and yes would be my answer. No because if the PV valve is the primary means of venting on a ship (for example on chemical tankers), then this cannot act as the secondary means of venting too. And yes because if each tank has two PV valves fitted on each tank, one of these PV valves will act as primary means and other as secondary means of venting. If you are wondering about the possibility of having two PV valves on each cargo tanks, let me clear the air by saying that I have seen quite a few product tankers with that arrangement. The most common secondary means of venting fitted on modern tankers is the pressure sensors. And if you see, these are not exactly the means of venting. But still these can act as the secondary means of venting. The purpose of these pressure sensors is to alert the operator (duty officer) by an alarm if the primary method of venting fails. SOLAS permits the pressure sensors fitted on each tanks to be considered as a alternative to the secondary means of venting. 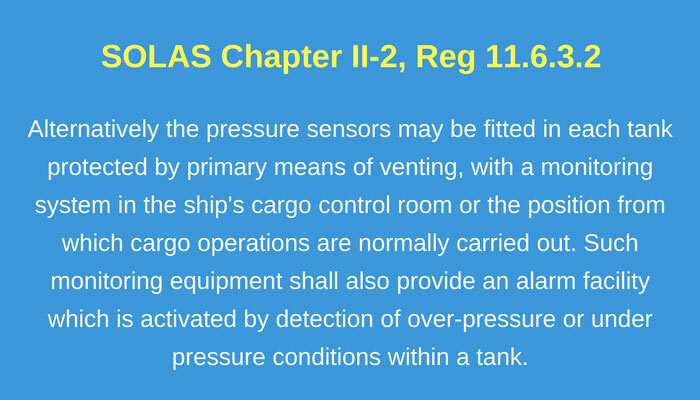 Alternatively the pressure sensors may be fitted in each tank protected by primary means of venting, with a monitoring system in the ship’s cargo control room or the position from which cargo operations are normally carried out. Such monitoring equipment shall also provide an alarm facility which is activated by detection of over-pressure or under pressure conditions within a tank. These pressure sensors are fitted on each of the cargo tanks. But to timely alert the duty officer for the failure of primary method of venting, the alarm level of the pressure sensors must be set accurately and correctly. 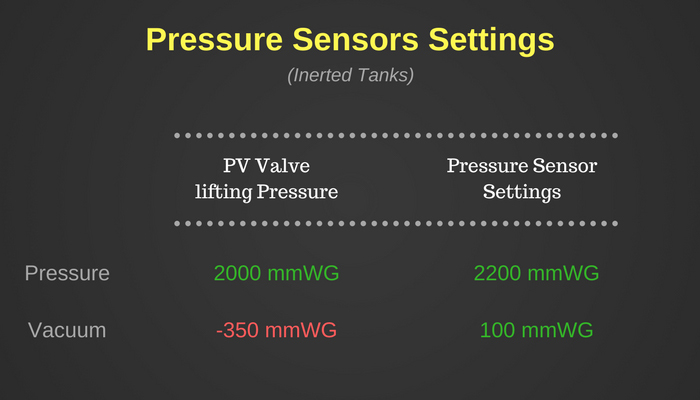 Let us understand what these setting of the pressure sensors should be. If the PV valves are working correctly, the pressure inside the cargo tank will never exceed these levels. It is only if the pressure inside the tank increases to more than the PV valve settings that the duty officer would like to be alerted. So when loading, the duty officer would like to be alerted when the pressure inside the tank is more than 2000 mmWG. And when discharging, the duty officer would like to be alerted when the vacuum inside the tank is more than -350 mmWG. But would we like to be alerted when cargo tank pressure is just above the PV valve lifting pressure, say at 2010 mmWG ? There can be many reasons for the slight variation in maintaining the cargo tank pressure levels by the PV valves. So how much variation can be allowed? OCIMF recommends this variation to be maximum 10% over the PV valve set pressures. Till the time there is no alarm, it would mean that pressure inside the cargo tanks is less than these values and duty officer need not worry about it. If the alarm sounds for a tank, duty officer need to reduce the loading (or unloading) rate in this tank and investigate the reason for over-pressure in the tank. When vessel carries flammable cargoes, the oxygen level in the tanks is maintained at below 8% by volume. This is done by inerting the tanks. When the tanks are in inert condition, we cannot allow the air to come inside the tank otherwise the oxygen level inside the tanks will increase. So when loading, the tanks will be under positive pressure and excess pressure will be ventilated either through Mast-riser or through PV valves. When discharging the cargo, we cannot let the vacuum side of the PV valve lift. We supply the inert gas to the cargo tanks to keep these under positive pressure. The positive pressure is more than the PV valve lifting pressure while loading the cargo. So the setting for positive side will be 10% more than the PV valve lifting pressure. The tank is under vacuum when discharging the cargo. So the setting for vacuum side will be any positive value close to zero. Usually 100 mmWG is set in this case. Vapour return line is used when the vapours of the cargo are considered to be toxic. 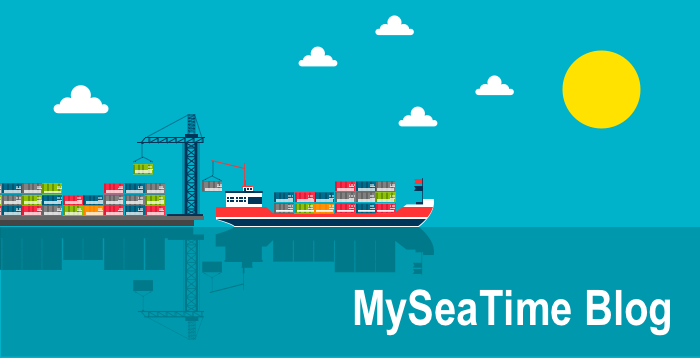 Sometimes it is used for non-toxic cargoes too because of terminal requirement. 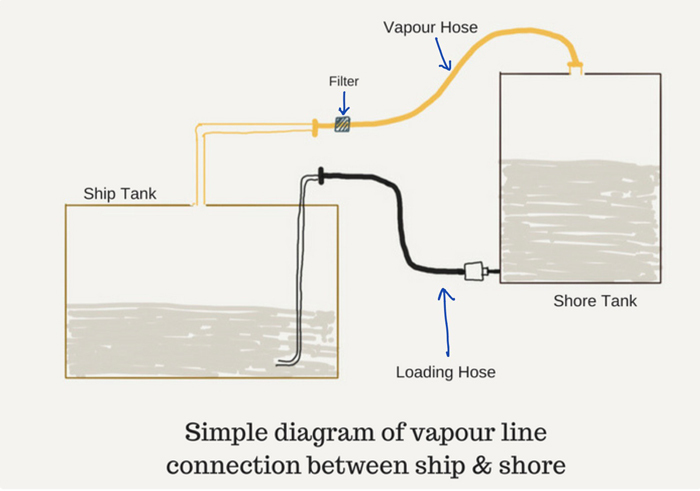 Vapour line allows the connection between ship tank’s vapour space and shore tank’s vapour space. The vapour spaces of ship and shore tanks will always be in equilibrium. We use the vapour line with a purpose that there should not be any release of cargo vapours into the atmosphere. This means that we cannot allow the PV valves to lift at any time. So what alarm settings we must have for the pressure sensors in this case. The duty officer would like to be alerted before the pressure inside the tanks reaches the PV valves lifting pressure. So for pressure side, the PV valve lifting pressure is 2000 mmWG, duty officer would like to be alerted before that tank pressure reaches this level. The alarm need to give sufficient time to the duty officer to take corrective actions before the PV valve lifts. Industry practice considers pressure sensor setting of 10% lesser than the PV valve lifting pressure as having sufficient time to take action. So in this case pressure sensor setting for pressure side need to be 1800 mmWG. For vacuum side, the alarm setting would depend on if the tanks are under inerted or not. If the tanks are inerted, we cannot allow the tanks to be under negative pressure. 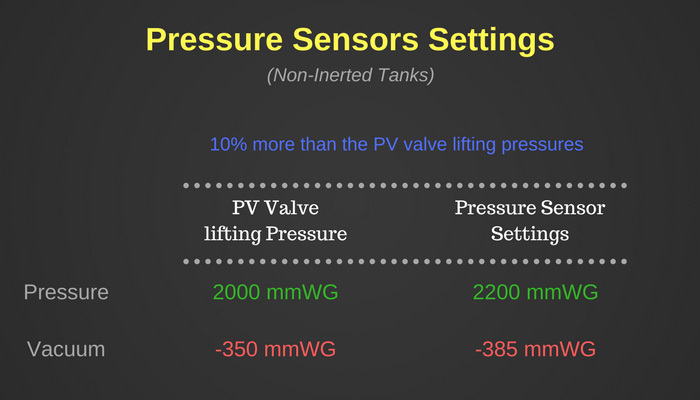 In this case, the pressure sensor setting would be anything positive (100 mmWG is preferred). If the tanks are not inerted, the aim would be to not allow the vacuum side of PV valve to lift at any time. Because the vapour space of ship and shore is in equilibrium and any abnormal pressures in the ship or shore tanks would mean something wrong in the vapour line. If during discharging, the ship’s tanks are going under vacuum it would mean that the vapours from the shore tanks are not returning to the ship’s tanks. This would also mean that shore tanks would be under high pressure. If we allow the ship tanks vacuum to be filled by the air (by allowing the PV valve to lift) then pressure in the shore tanks would keep on increasing with the transfer of cargo from ship. At some point then, the shore tanks would need to vent the excess pressure to the atmosphere. This may considered to be a serious incident considering the toxicity of the cargo. So the bottom line is that we must not allow the PV valve to lift in this case. In this case the pressure sensor setting need to be 10% lower than the PV valve lifting pressure. So if the PV valve lifting pressure is -350 mmWG then alarm will be set at -315 mmWG or less than that. Usually -200 mmWG is preferred in this case. PV Breaker is another mechanism that acts as a secondary means of venting on crude oil tankers. PV Breaker is located and connected to the common IG line of the ship. PV Breaker works on the principle of set water column filled in it. It allows the pressure to release from common IG line by emptying out the filled water in PV breaker. It also allows to break the vacuum by allowing the air inside the tanks through common IG line. However as per a recent amendment to SOLAS, the tankers constructed after 01 Jan 2017 need to have an independent secondary of venting for each tank. For these ships, PV Breaker cannot be considered as a secondary means of venting. On tankers the cargo is loaded in a closed environment. But the when loading or unloading the cargoes, the air (Or vapours/Inert gas) need to flow in or out of the tanks. The arrangements provided for this exchange of air/Vapours/Inert gas are the venting arrangements on the tankers. The arrangements used primarily is the “primary means of venting”. These arrangements usually are either Mast riser and PV Valves (High Velocity vents). The venting arrangements provided for automatic activation in case of failure of primary means of venting are called “Secondary means of venting”. Secondary mean of venting can be 2nd PV Valve on each tank, PV Breaker or pressure sensors fitted on each tanks with alarm in CCR. Pressure sensors are most common secondary means of venting on tankers. Duty officers must know the required alarm settings for the pressure sensors according to different operation conditions. As per amendment to SOLAS, PV Breaker is not considered to be the secondary means of venting for tanker built after 01 January 2017. Very useful info ,Sir ! The way you explain things and make them easy to understand is brilliant. Looking forward to your next articles especially pertaining to tankers . Interesting and beautifully narrated as usual. Nicely explained. Simple and easily understood. Dear Sir You have explained very well, but I have a small doubt. 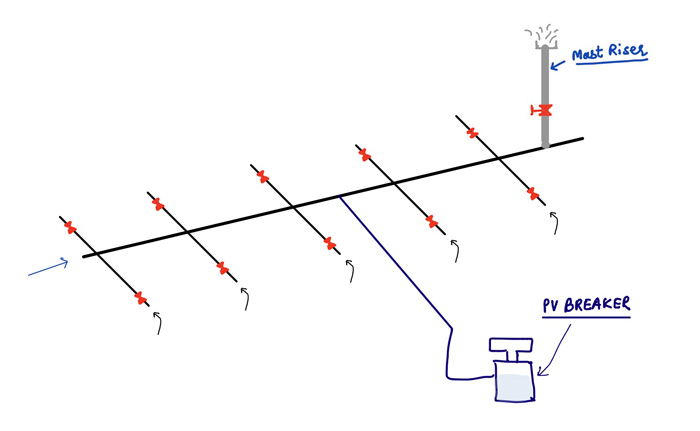 If mast riser is considered to be as a primary means of venting then obviously PV valve installed on individual tanks would be considered as secondary means of venting. Still Sire inspector doesn't agree on this and insist installation of individual tank pressure monitoring system although we had PV breaker as well. Surely inspectors do not like vent mast to be considered as a mean for venting cargo vapours. Mast riser is a past this days. Having all those vapor/gases escaping without high vilosity to the sky, those on deck are exposed to the toxic vapors from crude or other vapors. Dear Capt. Rajeeve , you have explained the venting systems on tanker in very detailed and simple .. its very useful for the tanker people .. thanks very much expecting more on tanker operations. Explained very easily..Thanks alot sir. I found this article very informative. 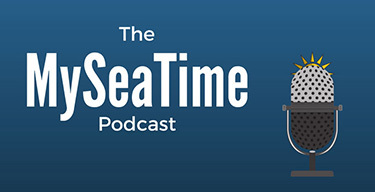 https://www.myseatime.com/ is sound valuable site. Capt. Jassal: Do you know of any operational offshore vapor emission control systems for the venting emissions from crude oil loading in ULCCs and VLCCs? Dear Capt, I would just correct pressure sensor settings for vacuum side, plus 10% should net be taken literary as we need to keep positive pressure in the tanks at all times, -350 is given as last stand to protect the tanks from damage. Vacuum side should be set to +150mm as on +200 you have first alarm and on +100 your cargo pumps trip. Discussed above with all oil major vettings and accepted it. Thakyou sir, Your blogs helped a lot in clearing my doubts and getting my coc. 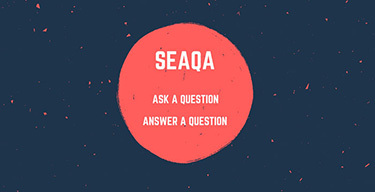 Very useful information. Appreciated for sharing. BEST BLOG ON VENTING SYSTEM. THNX FOR THIS USE FULL UPLOAD. Really sir... its a very helpful article... the way u explained... excellent!!!! Greetings Capt Rajeev, Appreciate if you can clear my doubt/misunderstanding wrt venting system mentioned in Ship Shore Safety CL, point no.29. Self used to write NA for discharge operation and in comments used to mention Discharge Operation, IG in use. Unfortunately got observation. Donno how to put it across. Still I feel I’m right. Appreciate if you can throw some light. Thanks in anticipation. you are never said any single word about the THERMAL VARIATION in a cargo tank. plz describe abt that.. how that will compansate.. because according to SOLAS 11-2 PART C , REGULATION 11 , 6.1.1 vlearly mension abt tht. Your article captain Rajeev was really useful and helpful for me. Please keep going your nice work, giving the opportunity to other seamen and officers to learn and broaden their knowledge regarding the tanker ship practices. 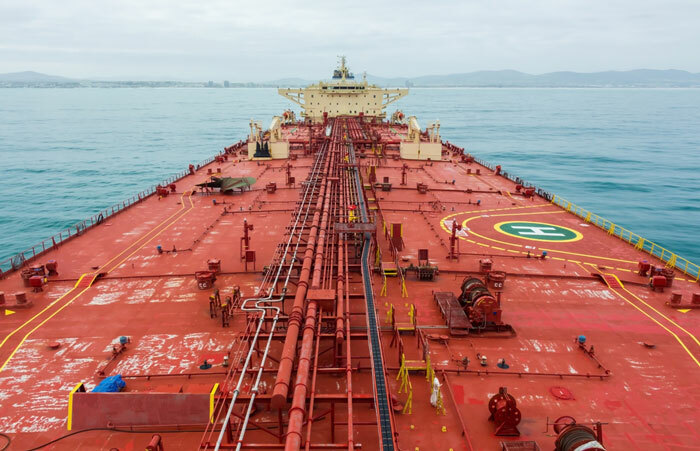 why do we use mmWG as a unit of measure on board tankers ? Dear sir - ours a bitumen carrier-non inert ed . ( built -2003) with oil tanker Notation . The P-V valves are pressure tested and certified to +1400 MM WG and -700 MM WG . Where as the P-V- Breaker as per Maker designed To +1610 MM WG and -700 MM WG . The negative side of both P-V breaker and P-V valve are coinciding . we slso have pressure sensors for each tank with alarm in CCR. kindly advice on this - weather it is acceptable or not . Very nicely explained. Thank you Sir! Dear sir, very pleased to read your interpretation of venting arrangment for the tanker. but as per the requirement. how to control small volume in tank due to the thermal variation. If onbard chemical tanker, the arrangement is like this PV +Pressure sensor. , so the small volucme is passed through P/V valve. if onboard cruede oil, the arrangement is master riser +pressure sensor, the samll volume can't pass. do you agree? only master riser + P/V can meet the requirement. Dear Rajeev, I have read your article and in my opinion found some errors and omisson. Firstly The design of your P/V valve would be 2000/-350 but it is not the maximum working limits. For example ; Although a P/V valve set to 2000 it is not necessarly need to set to design limit's %10 more because its maximum working limit at your tank's loading limit would be say for instance 2200. If you put 2200 to your secondary alarm limits your tank radar system will warn you at the limit where your PV valves works at their maximum rate. Similarly, When you are discharging a P/V valve would be set to -350 however its maximum vacuum rate for the pump's maximum capacity would be -380. If you set he alarms to -380 mm once again your secondry system will remain at alarm all the time when you are discharging at the maximum rate. Let me hear your response by e-mail. Thanks in advance.